For the record, I have always considered Faber as something of a lightweight. As Zero Hedge noted, he is always making some kind of doomsday forecast that never comes true. I don't even rank him as an Austrian-lite. He's a hustler, selling both snake oil and occasionally aspirin. In June 23, 1926, John Maynard Keynes delivered an unusual economics lecture at the University of Berlin. This event has gone almost completely unnoticed by Keynes’ principle biographers, despite what would seem to be a historically significant product. A few months after the event, Keynes heavily edited the Berlin lecture into his well known essay, “The End of Laissez-Faire.” The resulting pamphlet is arguably Keynes’ second most famous work, after the General Theory, as it articulates a formative step in his broader case for using the tools of the state to prescriptively intervene in certain matters of economic policy. 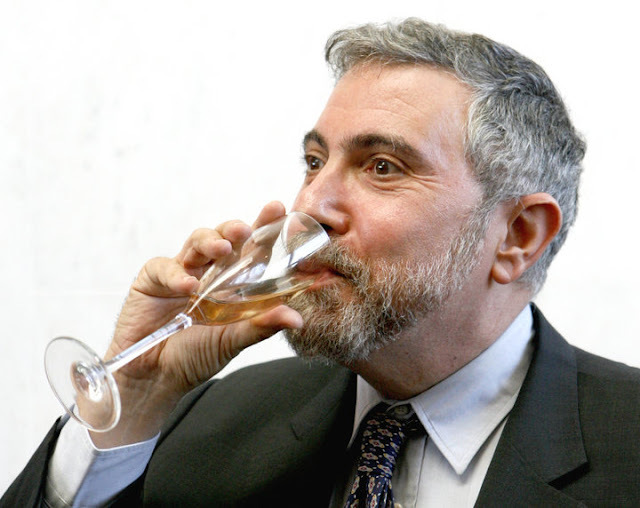 not clever enough to get Krugman's humour eh? Fallacies Of Composition are supposed to be humorous? One of the perks of being part of ((the tribe))) is being able to scream racism/anti-semitism about anyone and anything, plus having a backup country to flee to once your communist policies have destroyed your host nation. It's more SOP than insanity. This is how left operates. They will find a person who believes in something they don't like, in this case gold, and then use something else that person believes or said or did to smear everyone (or many) who believes in what they don't like. This is intentional because establishing the link causes people to shy away. If they paint gold as racist then it is hoped more people will stay away from gold. Meanwhile, today, most people are enslaved to debt....so? The devil himself could be a "gold bug" and it wouldn't change the truth of the moral and economic superiority of market-based, voluntary money over monopoly-controlled fiat currency. Oligarchy is a form of slavery. If someone can tax what you own, they own you. America's government is a democratically-elected oligarchy. Hooray for US. Please note that the Libertarian Party clowns are so afraid of the SJWs that for 40 years they haven't been able to muster the courage to simply explain to religious conservatives that libertarianism allows private religious communities which can ban anyone for any reason, including folks who are not religiousy pious in the specifically required manner. Pointing out that "white nationalist" types could do the same would cause their heads to explode. Basically, "libertarians" have been misrepresenting the nature of libertarianism to avoid SJW attacks while millions of "religious conservatives" think libertarianism is "socially liberal" when it is "socially" whatever the rules of the particular community say. The claim that "gold bugs" have been historically "racist" or even "socially conservative" is absurd. Keynes was the director of the British Eugenics Society from 1937 to 1944. The British Eugenics Society now calls itself The Galton Institute for obvious reasons. He who can does. He who cannot teaches. I will take Marc Faber who spent a career doing things in the economy over the guy who has spent his life just teaching about the economy.